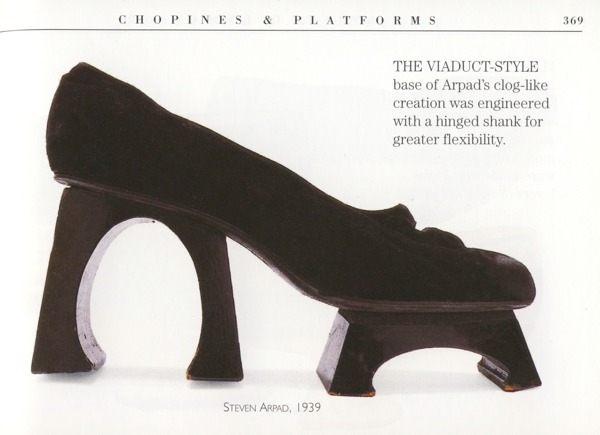 In this fantastical interpretation of footwear, Arpad presents an intensely inventive and unique rendition of the platform sole, an important feature at the time. Although the source of inspiration is not known, the arched supports strongly recall building or aqueduct forms, underlining the parallel numerous clothing designers have made between fashion and architecture. Also not available is a thorough Steven Arpad biography, in spite of shreds of information we've taken from yellowed digital sources. It's easier to find Arpad-inspired shoes than actual Arpad info - take for instance this Albanese of Rome platform here below - however, for a moment, we thought we could score. Steven Arpad's son, James, emailed us after we first wrote about his father's work and things looked promising. A friend sent me your site with the article about my father, and I am so pleased to have you interested and to be looking for me. I left NYC after he died, and moved south to Atlanta, Georgia to care for my mother who was terminally ill. I stayed here and no longer do fashion design. Please email me back as I would enjoy sharing with you about my father. We did it right away, twice, and finally James Arpad wrote back saying he would love to contribute to make available all the information about his father. A wonderful task - he said - especially for the great designs and talent to be discovered by his grandchildren and the world at large. 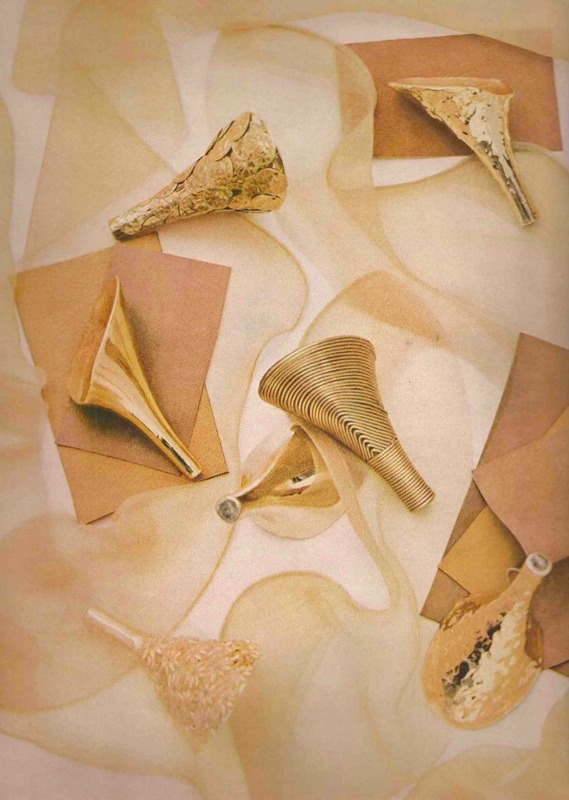 In a later email James Arpad asked us about the celebrated encrusted Ferragamo pump owned by Marilyn Monroe he saw in a magazine. The pavee jewelling technique was invented by my father, and he had done the jeweling for the Marilyn shoes for Ferragamo, but the magazine did not credit him, they just said Swarovski. The ruby crystal shoe was showcased at Florence's Ferragamo Museum and he was wondering if the museum did credit his father's work. I remember a particular Women's Wear Daily article from the 50's or 60's that wrote about my father inventing the art of Pavee crystal application, and how he was doing jeweled shoes as well as handbags and jewelry with it. It may be available online before I find it in my warehouse. It goes without saying that there was no trace of Steven Arpad being mentioned at the Ferragamo Museum. After that, things came to a halt. We wrote James again but his mail address stopped working and we were left with nothing. Arpad, with a long career in creative fashion in Paris and New York, is the originator of several new techniques in making jewelry and other accessories. Arpad does jewels and other accessories for the fashion collections of such designers as Norman Norell and Pauline Trigere. For Miss Trigere's fall and winter collection he used "pavee" on furs and evening clothes. to get an idea of the paste-up job involved Arpad said one triangular stole at trigere's alone used 54,00 stones. His factory has some 160 persons doing the various treatments. Beth Levine collaborated with Steven Arpad, a rhinestone specialist working with Balenciaga in Paris, to make the first fully jeweled shoe. 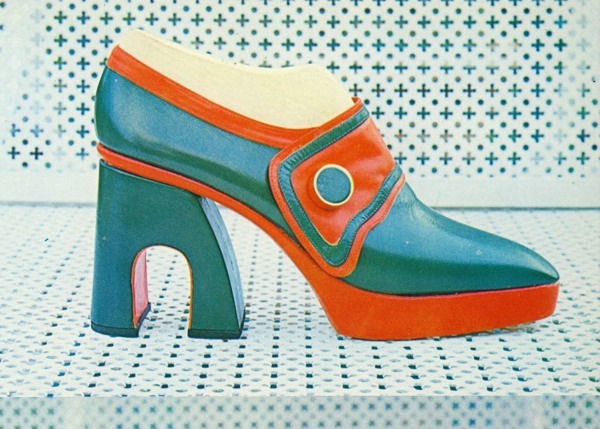 When Beth wore a pair of prototypes aboard a ship to Paris, buyers saw them and they became a sensation before she even returned home. 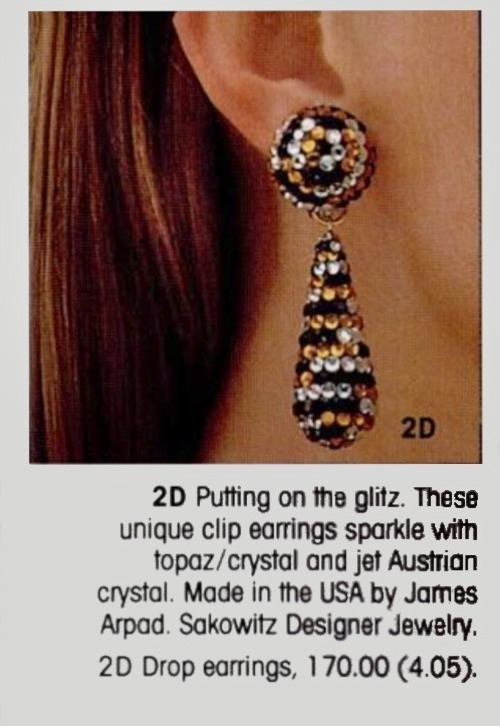 Curious to note Arpad as a "rhinestone specialist" and not as a shoe designer, a career he left behind probably a decade earlier. Another late discovery is the outstanding heel work here below from 1956 which makes easier to understand why we are so curious about his career(s). 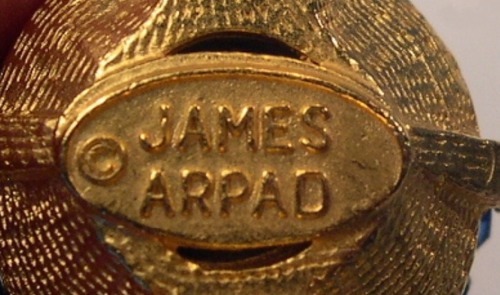 In the meantime we managed to find bits of information about James Arpad who followed his father's step as a jewelry designer. Red lapel ribbons, like those worn during the Academy Awards presentation to show support in the struggle against AIDS, are still being seen around town, including a glittery jeweled version. The beaded pins are the work of James Arpad, a jewelry designer, who is donating the profits to an AIDS charity. "I thought I would take it one step further and make it something of permanence," Mr. Arpad said. 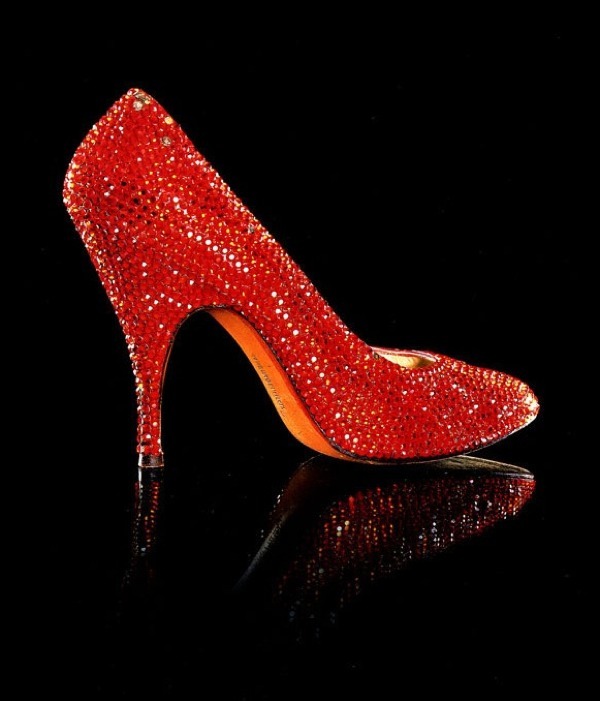 The pins are hand­jeweled with Austrian crystal pave on leather, to approximate the feeling of the ribbon. 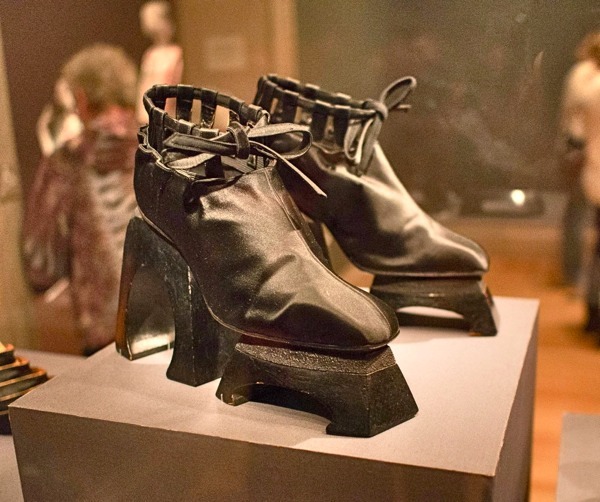 "A few people wore them at the Oscars, including Richard Pryor," Mr. Arpad said. "And Elizabeth Taylor wore one at last week's Amfar benefit." Originally created by a group of artists in downtown New York about a year ago, the red ribbons have become a fashion accessory. Mr. Arpad's version cost $100 and can be ordered by calling ----- The profits will be donated to the Design Industries Foundation for AIDS. 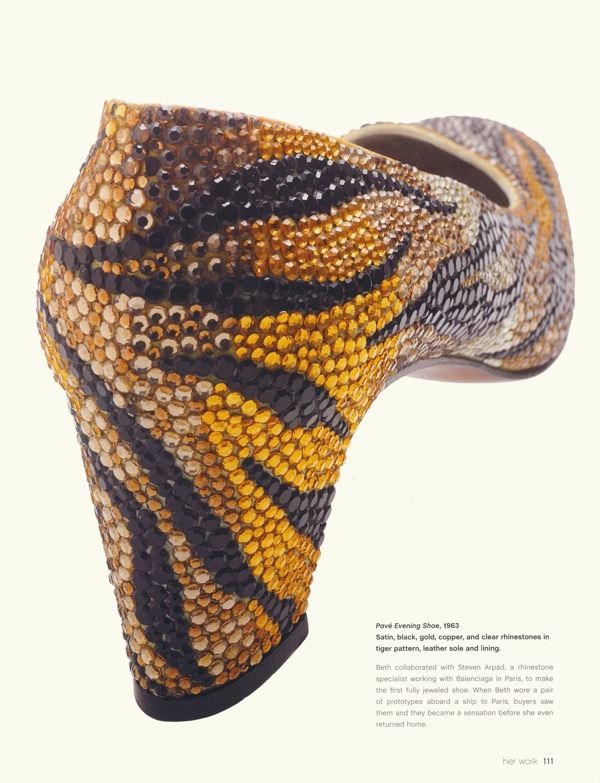 Jewels are cool, but we always come back for shoes and Steven Arpad's shoes never cease to amaze: like those few models from the MET collection on exhibit at San Francisco's Legion Of Honor (High Style - The Brooklyn Museum Costume Collection, March 2015). As far as we are concerned, we'd love to finish what we started, so would somebody, somewhere, provide any additional info about Steven Arpad and/or his son James?